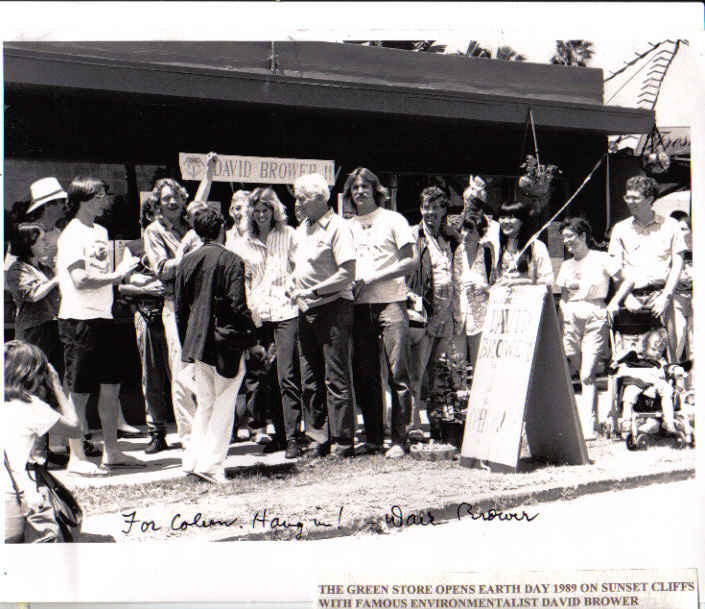 David Brower-silver haired older man at center of photo - joins the Green Store on opening day, Earth Day, April 1989. Colleen is to Brower's right and Kip is behind him. OCEAN BEACH, CA. Twenty years ago today, Colleen Dietzel and Kip Kruegar and other local environmentalists opened The Green Store on Voltaire Street for the first time. It was Earth Day 1989 – April 22nd. Ever since, the iconic ecology store has steadfastly held its ground, offering books, magazines, bumper stickers, buttons, T-shirts (OB Rag blog has our shirts there), posters and other green products and mementos, while also serving as an anti-corporate space, a lending library, a meeting site for area groups, and the headquarters for any thing green in OB. For instance, during the days that OB Grassroots Organization was alive, it used to meet at the Green Store. Plus when the group sponsored the garden at Voltaire Park in the empty lot across the street from the Green Store, the store was the center for maintaining the garden. Colleen at the first protest against Starbucks in OB, Spring 2001. Twenty years ago, Colleen and Kip were synonymous with OB’s Green Party. As their activism in that group faded, they kept active around any and every environmental issue, whether nukes, Styrofoam or protesting Starbucks. Colleen can still be found in the store most days. She does recycling for a number of Ocean Beach bars and restaurants as her other paying job. A few volunteers help her out in the Store. Kip works for the Urban Corps. There is a celebration starting at 2pm at the store. Everyone is welcome to come by for cake and other goodies. The store is located at 4827 A Voltaire. Go by and wish them a happy anniversary. Twenty years – most businesses never last that long. Colleen and Kip have made it happen. I just returned from the celebration at the Green Store. They had organic cakes and organic wine, and a keg of beer. Isn’t that enough? Colleen and Kip were both there, Dave Sparling, Enrique, Colleen’s brother, Helen, Kathy Blavatt, Keith and Joanie, Dave Gilbert walked by with 3 dogs, Patty Frank, …. Congratulations to the Green Store, Colleen and Kip! Congratulations to Colleen and Kip! 20 years! Wow! Go Green Store! I was there in spirit guys. Yea, congrats! thanks for hanging in there Colleen and Kip. For many years you two personified OB environmentalists. Cheers to you both. Do any of you know Patty/Pat Kopit? I am trying to get word to her that one of her long-time, close friends has just gone into hospice care, but I don’t know how to reach her–other than the miracle of the internet and people who care. If someone responds, I can leave a phone number for Patty to get in touch with the family of her friend. Wow, it’s 2014 and I’m just now seeing your message, sorry. I did, briefly, find Pat. I do not have any contact info for her at all, phone or address. I so wish that I had a way to be in contact with her. How about you? Have you found her? If so, please tell her Launa wishes to connect with her. You can find me via Facebook or white pages, I believe. Are you my namesake? I love your early awareness of Green. Its great there is some recognition. Im inspired. Colleen, you truly are an inspiration to many. Rio, Colleen, and several others I have met in OB have really made me evaluate my priorities. Tomorrow you will get the premier issue of Ecotistic magazine deliverd to the Green Store. We are honored to be have an editorial about Flea Free Organically. Feel free to contact me at any time.